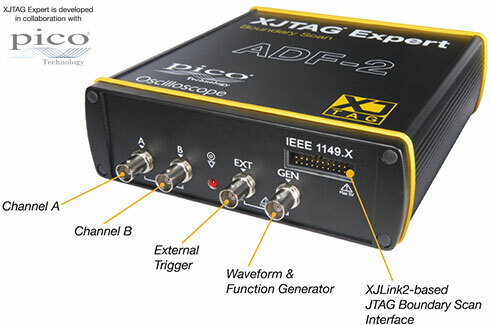 XJTAG Expert is the world’s first portable Boundary Scan test solution that comes with digital oscilloscope, waveform and function generator, spectrum analyser and serial protocols analyser. Its USB 2.0 to JTAG adapter provides a high speed interface to the JTAG chain while the advanced features make it easier to test, debug and repair a wide range of circuit boards. The portable design means the XJTAG Expert ADF-2 can easily be taken to the Unit Under Test (UUT).